My friend Lucy is off on another artist residency. This time it's not the remote Shetland Islands, but an equally remote spot in rural Ireland and it involves bread baking. So she came round yesterday morning for a skill sharing exercise in making bread. If you've never made your own bread, please give it a go. Yes, it does take a bit of time with all the proofing and rising, but it is so worth it. I can't tell you how satisfying it is to pull a hot, fragrant, golden loaf from the oven. To me it's a little bit like magic every time and from Lucy's enthusiasm I deduced that it was the same for her. To befit the occasion properly I got out a soup and bread cookbook I bought in Ireland last summer and from it I chose the recipe for Herb Bread to make. So why not bake bread today or as Mrs Doyle would say 'go on, go on, aaahhh go on'. Mix in the salt, herbs and fennel seeds. Make a well in the middle and pour in the warm liquid. Add the yeast and the sugar and stir into the liquid. It's fine that some of the flour gets mixed in as well. Cover with a clean tea towel and place in a warm place to proof. Check after about 15 minutes. The yeast should now have frothed up. Start drawing the dry flour into the yeast and liquid, until it's all combined and you have a dough that is no longer particularly sticky. You might need to add a little more flour. Turn out onto a floured surface and kneed for about 3-5 minutes, finally form into ball. Wipe out the bowl and pour a little oil into it, before returning the dough back into it. Turn so it is covered with a light film of oil on all sides. Cover again with the tea towel and place in a warm place. Leave to rise until double in size. It should take about 1 hour. Turn out onto a lightly floured work surface again and knock the air out of the dough by kneeding a little. Shape into a high round ball and place onto a baking tray lined with baking paper. Make three shallow incisions across the top and do the same in the opposite direction. Leave for another 20 minutes or so to recover some volume. Bake in a preheated oven at 230C/Gas 8 for about 15 minutes then reduce heat to 200C/Gas 6 and bake for another 30 minutes. The loaf is done when it sounds hollow when tapped on the bottom. What a fun picture! I love making my own bread. Mmmm. Sage! I can smell it from here! I just love sage, but usually it is relegated to the ranks of cornbread. 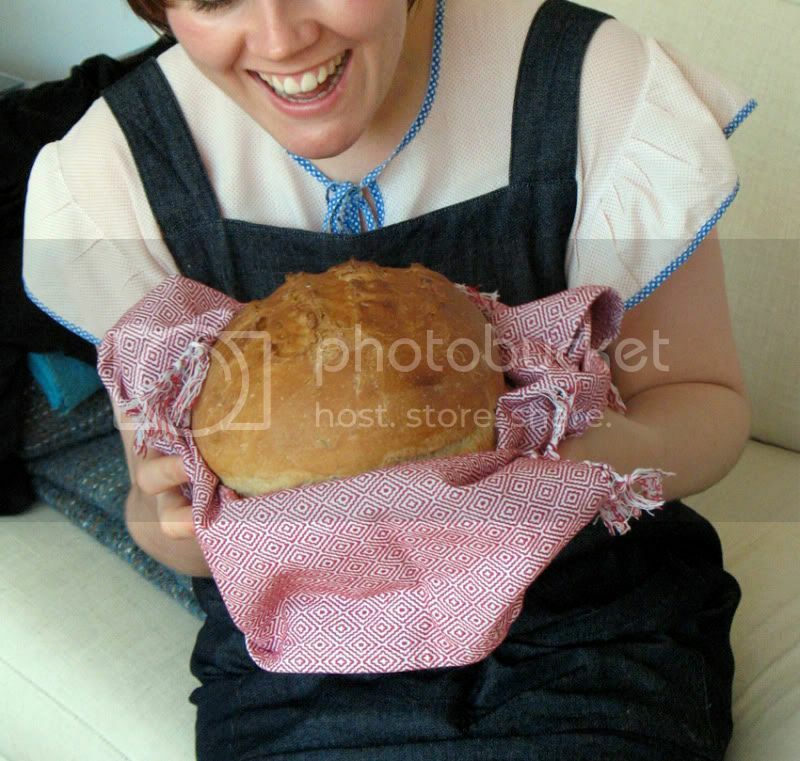 it has all my fav herbs.....n the bread looks like a darling baby....the way you hold it. Justin, it's pretty good, if I may say so myself. J. Danger, making bread is just the best, isn't it?! SulaBlue, it's good in normal bread as well. Try it! Eralda LT, I'll save a slice for you next time I'll make it. Sangeeta, that's actually my friend Lucy holding the bread. Doesn't she look lovely and so happy?! Chelsea, I agree eating it even beats making it. Now that's a beautiful loaf. I find bread baking very therapeutic indeed. I love making my own bread, the smell of the dough totally does it for me! 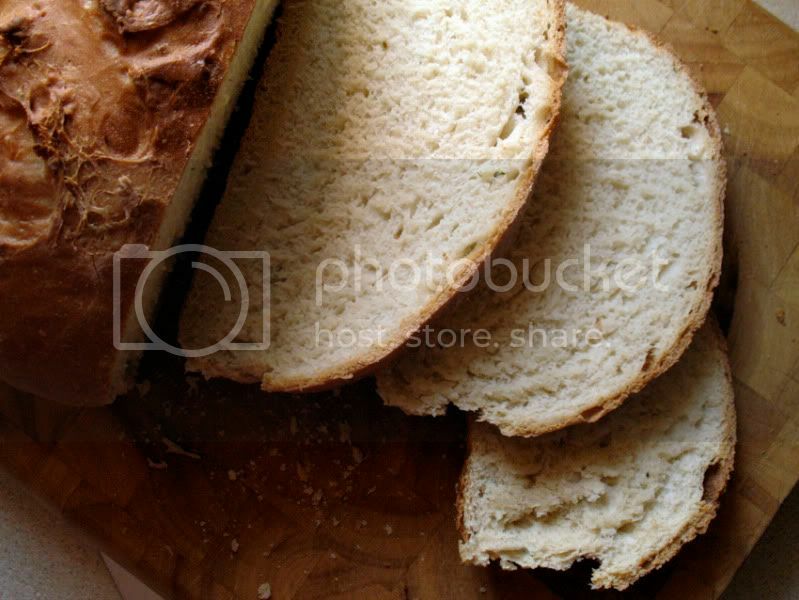 There is nothing like homemade bread, and this one looks fantastic! Your bread looks really good Sylvie. I am not a great bread maker by hand, but do alright with my bread machine. In fact I have a french loaf in there right now! Good for Lucy; hope she has a fabulous time! I've made my own bread for decades and love home made bread. You're right, it's just not that difficult once you get started. Now I don't even use a recipe.